For days the southern point of the Lofoten Islands, Norway, had been taunting us. We could see it on clear days in the distance as a dramatic cliff dropping straight into the ocean. Every day the anticipation grew as each paddle stroke brought us closer to this infamous point. The southern point of the Lofoten islands is called Moskenestraumen and is famous for its Maelstrom. Defined as a powerful whirlpool in the sea, a state of confused movement or violent turmoil caused by opposing currents, it is a paddler’s nightmare and dream. The Maelstrom is unusual in that it occurs in the open seas, whereas most whirlpools occur in confined straights. Three factors contribute to this phenomenon; strong diurnal currents around the point, a shallow ledge off the point and the abnormal shape of the seabed. This place is so famous, that Greek philosophers described this area 2000 years ago, and Jules Verne and Edgar Allen Poe have used it as dramatic backgrounds for their stories. As a paddler, these sorts of challenges and places seem to call my name. I felt like a magnet was drawing me closer and closer to the Maelstrom, and my excitement was building with each day. One day before our fated meeting with the Maelstrom, we passed the last small fishing village on the southern coast. As we rounded a particular corner, the whole coastline took on a different personality. I felt a heightened sense of awareness as the low clouds added a moody, almost angry feeling to the air. The granite cliffs became dark and sinister; the water took on a black, oily color. My soul began to soar, and I imagined this is what the Vikings felt as they plied the waters of this area, searching for adventure and freedom. I felt as though freedom, power, humility and wildness all coalesced into a singular motivating force, drawing me forward. 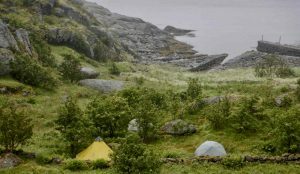 Our last camp before the maelstrom, turned out to be our last camp for two nights as the winds picked up, the seas turned into a frothy white mess, and all we could do was postpone our rounding of the Maelstrom as the sea god Aegir seemed to be flexing his muscles. Aegir was both worshipped and feared by Norse sailors, as this god of the sea would occasionally rise to the surface to take ships, men and cargo to his hall at the bottom of the sea. We contemplated offering Aegir some sort of sacrifice to appease his angry mood. We didn’t come up with anything that seemed sufficient! We awoke on our second morning at this camp, to calm winds, flat seas and blue skies! We were ecstatic, this would be the day we would experience the Maelstrom. 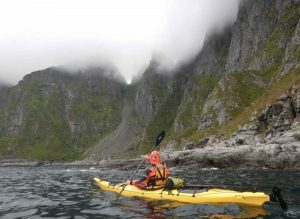 As a kayaker, timing of the maelstrom can be the difference between success and failure, between an amazing experience and a terrifying experience. We had poured over all the information from books and locals about the movement of the currents, and we were pretty sure we had it dialled. As we approached the maelstrom, we could see ripples in the water, tell-tale signs of the currents beginning. We entered the currents and we were propelled forward as the current was with us. We could see the Islands of Veroy and Ross in the distance, 15km and 40 km respectively to the south west. I filed this information away in the back of my head, as one day that would be the next challenge. There was one place that locals had said not to go. There is one long and thin island, in the very heart of the Maelstrom that no matter if the current is slack or moving, is always like a raging river. As we neared the entrance to this river, my white water kayaking brain took over (sort of like the reptilian brain!) and we headed straight for it. As we entered, I felt like I was on a large volume river in Nepal. The boils and eddy lines began to form, the banks began to fly by, and at the “end” of this channel a line of breaking waves were continuously showing their power. Our adrenaline started flowing as we approached the breaking waves. The sea state beyond this river was wild, confused, with swell coming in from the North and the current pushing from the south. The maelstrom was showing us a tamed version of its wild and rugged power, anymore and we would have been powerless in its wake. The bow of my boat started descending and then a wall of white water descended over my entire upper body, I paddled through two more lines of white water and then ferried my boat across the current for 10 minutes. 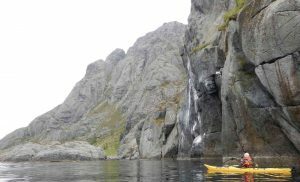 We came to a calm, protected bay and just sat there in our boats, taking in the beauty and rugged wildness of the area. We had just paddled the Maelstrom with success. Our adrenaline was pumping, the grins on our faces were wide, and we sat there with a sense of awe that Aegir had let us pass safely, with a small taste of the power he wields. Next Next post: A Picture is Worth a Thousand . . .